Probably no single performer has impacted the uke world in 2005 the way that Jake Shimabukuro has. This year saw him serving as official tourism spokesperson for Hawai'i, opening for Jimmy Buffett, and hitting (almost) prime time on the Conan O'Brien Show. One bit of proof is the number of new Ukulelia readers who have come to us in search of information about Jake and his music. Our readership hit an all-time high this month, due in part to the Jake phenom. Well, Dear Readers, this is probably our last blog post until Santa has come and gone. Don't forget to serenade your loved ones under the mistletoe with a uke tune or two. And here's hoping that Santa's elves have crafted the perfect four-stringed present for you this year. On behalf of Mark and his family, Merry Christmas from the entire Peare Troupe! 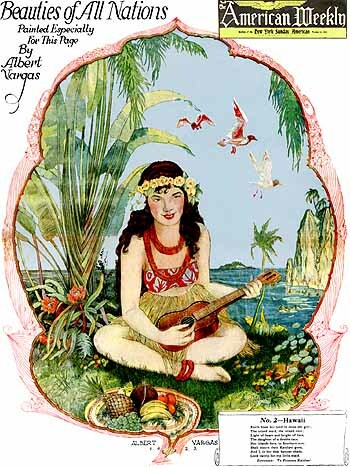 Ukulele Sweetheart Victoria Vox plays a KoAloha "Pineapple Sunday" model soprano. The Pineapple Sunday is the first uke in KoAloha's new "Papa KoAloha's Masterpiece Collection." There's no information about this model on the KoAloha site currently, but here is a link to a Japanese fansite with a photo of said model. It features an embellished pineapple body shape with a textured top. The origin of the name? Sez Papa Alvin Okami, "It's in the shape of a pineapple, and the idea for the design came to me on a Sunday, so that's why it's called Pineapple Sunday." Northern California Coast surfboard shaper Paul Kraus also makes ukuleles. Not only that, he's also a documentary filmmaker, and recently released "The Jumping Flea, Tales of the Modern Ukulele." "Paul Kraus, filmmaker and ukulele builder, takes us behind the scenes to meet some of the most influential ukulele builders and players today! The music comes through loud and clear, with Jumpin’ Jim Beloff guiding us through the different eras of the ukulele’s popularity. An exceptional documentary film, featuring the music of Lyle Ritz, Jim Beloff, Bill Tapia, Bryan Tolentino, Michelle Kiba, and a host of others." Brad Clark dropped us a note with more information on his Ukeladay ukes. (See earlier post, below.) Following are links to the images and spec sheet that Brad provided. Wow. As the daylight dwindles and Winter nears, our thoughts turn to the sultry clime of...Green Bay, Wisconsin? "February 7, 2006 will see the release of Victoria Vox and Her Jumpling Flea. In December '05, Vox debuted the songs in Hawaii (O'ahu and Maui). Vox is now sponsored by KoAloha ukuleles. " Check out her Christmas song, "Christmas With You". If you can't slip a Martin 5K in my stocking this year, perhaps you can grab one of these babies made by elf/luthier Ken Potts in conjunction with elf/grand-uke-panjundrum Chuck Fayne. "The reproduction of the ORIGINAL HAWAIIAN UKULELE SOUND seems to have been very elusive. Many have tried and some have come close. Close examination of the works of the early makers; Diaz, Santos, Nunes, Mossman, Sam Chang, the Summers Brothers and many other named and unnamed instruments finally revealed their secrets. Knowing the secrets and translating that knowledge to reproduction was not an easy process. However, through trial and error, Ken Potts has done it. We at KAHIKO VINTAGE REPRODUCTIONS are proud to announce the sound we have all been waiting for-- THE CONCERT FLYER--the player's lifetime companion. This instrument continues where others leave off. The CONCERT FLYER has the sound and look of the past with the improvements of the present. We would like to thank all those whose experimentations have made our job easier. WE uncovered the mine; they helped dig the tunnels." " I promised all of you that I would tell you about anything new that I thought was terrific. When I came to Australia 9 years ago, I began to look around for ukuleles. There was nothing. As far as I could figure out, there were two companies and neither making ukuleles then. One was JMG a weird uke made a lot like a violin and it sounded horrible. The other was a Maton, a company that is still in business, but no longer made ukes. by our standards , the ones they made were just passable. I went to visit the Maton Company and met a man named Brad Clark. We talked about ukes. He was later fired by Maton, a move I assume they regret to this day. He opened his own Guitar business and revolutionized the making of modern instruments by turning back the clock 300 odd years and by using some of the old and some of the new coupled with a world recognized sound system that is regarded by many as “the best”. 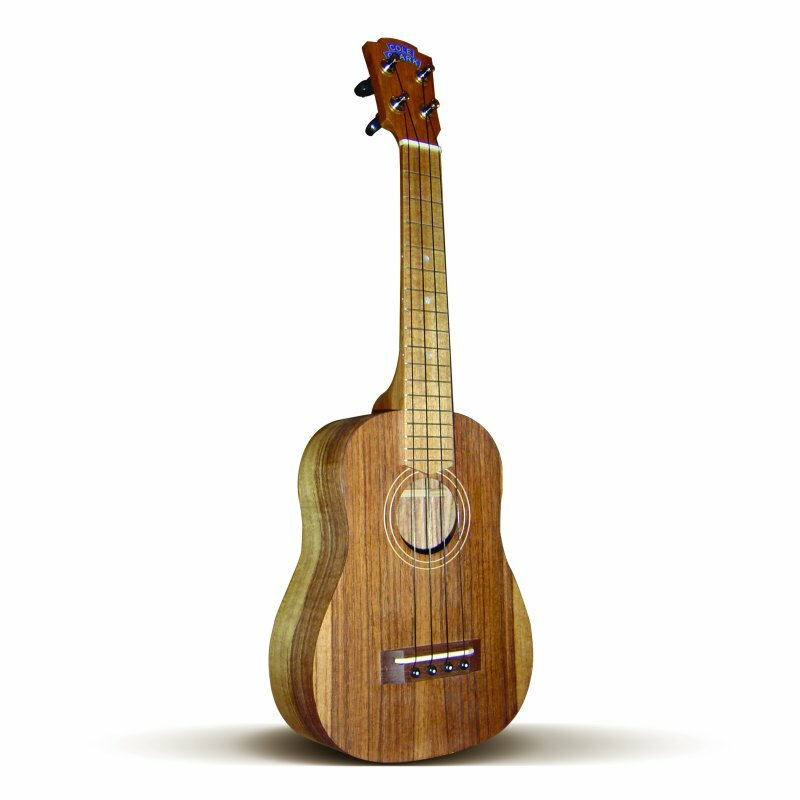 Cole Clark Guitars has begun to make ukuleles with the same quality. They are manufactured in three styles. Each more fancy but all with the same fabulous sound. They are really a player’s instrument. They are larger than a soprano and smaller than a concert. You can see them and find out all future plans for the uke by writing Bradley@coleclarkguitars.com. I suggest you do, this is one of the best sounding and revolutionary ukuleles to be made to date. There, I lived up to my promise and am please to be able to tell you about the 'UK-E-LADY'." 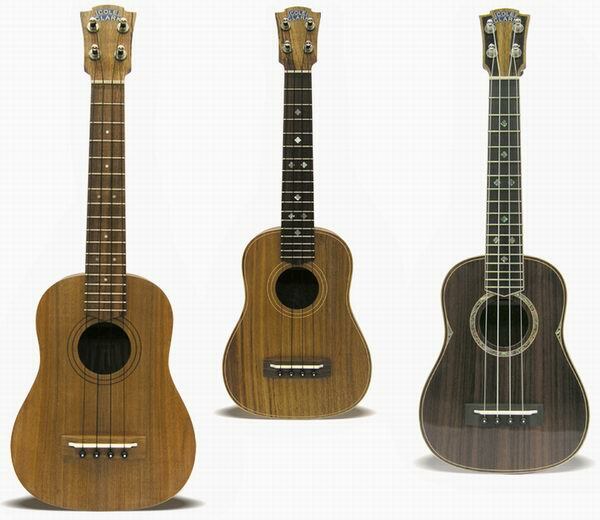 Currently there is no info on the ukes on the Cole Clark site, but here are some photos in the meantime: Photo 1 Photo 2. "The Kazooka electric kazoo can be connected directly to any microphone or instrument input on almost any audio device with no need for batteries or phantom power. Examples include: computer sound card, guitar amplifier, P.A., digital workstation, cassette 4-track, mixing board, guitar pedals, karaoke machine, mini disk recorder, sampler." Here is a link to the Vancouver Ukulele Circle site where there is a great collection of Christmas and holiday songs with uke chords "compiled by Mr. R. Shaw, who has done his best to include songs for everyone's enjoyment and seasonal fulfillment." UPDATE: And lo, the tabs were scanned and yea, they were uploaded. With special thanks to Mark Childs, who graciously sent me Bob Remstein's arrangement two years ago. I hope you enjoy my uke arrangement. Do drop me a line if you develop any improvements! "I have a lot of optimism that making music can become part of our daily lives. And I think the ukulele might be the big part of the renaissance of music-making in America. It's easy to learn, and something magical happens when you play it." "But why the baritone? I love tenors too. I love them all. But the bari is the uke of the American Dreams era. Godfrey. Boone. Kingston Trio. Vega. Favilla. The 50's. They deserved their own website! I also like monkeying with the strings and tunings. Especially baris like the smaller Vegas can be strung with a high D or even Aquila's C tuning strings and you get a "fifth uke", in between the tenor and bari. (And of course, the frets are bigger)." What do you get when a uke player crosses Pilates with Burlesque? Naughty Pilates, natch. Shown is instructor Christine Gladney (with uke) strumming while local Memphis roots-rocker Amy LaVere (of Amy & the Tramps) sings a seafaring song and Marny Star demonstrates a leg kick called "The Mermaid." This might be the only appearance of the uke on the DVD, but, hey, it's an excuse... Link Here's a related news article, to boot.